You’re an adventurer. You thrive outdoors and have a deep-rooted connection to nature. You’re looking for a rustic, traditional retreat with a modern twist. Or maybe you know that you just want to live off grid, in a small cabin in the woods. Maybe on a mountain or by a lake? You love the look, feel, and wonderful aroma of a log home. You desire the tranquility, luxury, warmth, energy efficiency, and peace of mind that comes with living in a log home without the maintenance. You’ve bookmarked lofts, docks, decks, gardens, bunkies, wooden bar stools, a harvest table, or even bear-print and plaid bed sheets. You’ve got a picture in your mind of the end product. Maybe you already have a full floor plan and just need someone to build it for you. Maybe you just know that you want to live in a log home but aren’t sure where to start or what you want. You’re okay with starting the process with an existing floor plan and adding your own personal touch. Ultimately, you need a milled log home company with a high standard of craftsmanship and professionalism to bring your vision to life. This is where we come in. Your vision is what it’s all about. True North Log Homes builds the most technologically advanced log homes in the world, supported by our 22 Canadian and US patents and over 40 years of experience in the industry. We’ve built thousands of homes throughout Canada, the United States of America, Great Britain, Ireland, Germany, Mexico, South Korea, the Bahamas, and Japan. We can help you design or build a log home that’s any size: from a cabin in the woods to over 17,000 sq. ft.! Our log home packages come as just that: a package. You can build your home, we can engage the services of our sister company, Log Project Management, for a technical supervision, log stack and shell build, or we can project manage from beginning to finish. We are the only manufacturer of log homes in the world who offer a “Zero” Air Infiltration warranty on all our log homes. This means that we guarantee that your log home will be air tight, with no caulking or chinking necessary. The five-phase design, manufacturing and delivery process we use is a solid and well-travelled route. You have your own design or floor plan. Great! We’d love to build it. You found a design from our plan book that you love. You want a home completely custom designed around your family. Our favourite. Whether you’re looking at one of our floor plans or one you found somewhere else, think about the features you like the most. We can work your favourite nooks and must-haves into your design drawings. As we move forward, you get to see your design in 3D before any logs are cut. Stand in your great room, look out the kitchen window, explore your future home from every angle imaginable. Most people are visual and need to see their design in action. Imagination can run wild, but you won’t know what it looks like until you have a look! Seeing really is believing. Once you’ve really nailed down what you want, these drawings are used to get your builders permit and given to your builder for construction. These are wall-by-wall plans showing the courses of logs, their lengths and window/door openings. Our factory uses them to cut your log home. These plans are also used to piece the logs together during construction. Your home is manufactured at our leading edge facility in Bracebridge, Ontario. Here, you receive your log home package. Everything to protect you from the elements. We protect your investment as it’s manufactured and built with every aspect of your True North log home being carefully monitored with a digital inventory control system that protects your log home from loss, damage or theft from start to finish. Step one: Register on our website. Step two: Once you’re logged in, tell us about your vision. What style of home are you looking for? How many square feet do you have in mind? Do you have land already? Are there any “must have’s” in your new home? Our Design and Sales Consultants are here to help guide you through the process to make it easy. Explore the plan book for only $25.00. We’ll mail you a hard copy to flip through, but you can also view ideas online any time, anywhere. Find features that you can imagine as part of your home. Want to tour other homes to get a feel for what you want? Book a private tour on your own schedule. Order the plan book and browse 80 different plans or contact us to talk about your future home. 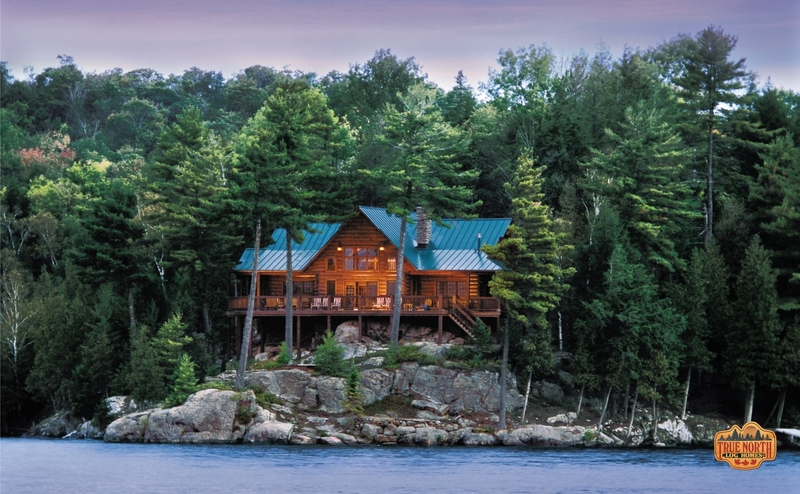 Learn, watch, examine, explore, and discover everything about True North Log Homes as a company, the products we offer, our manufacturing facility, and our design and building process. Pick the date that works best for you and we’ll see you soon!